Sometimes you have to do good engineering to straighten out twisted politics. 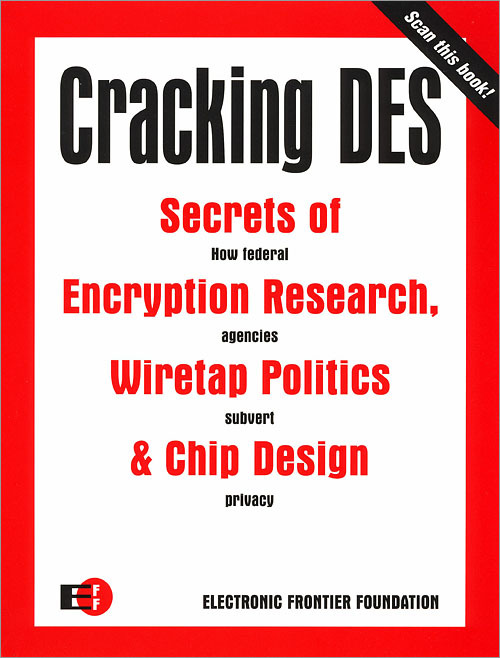 The Electronic Frontier Foundation, a nonprofit organization that was founded to ensure that the principles embodied in the Constitution and Bill of Rights are protected as new communications technologies emerge, and O"Reilly, the premier publisher of computer and computer-related books, team up to produce Cracking DES: Secrets of Encryption Research, Wiretap Politics & Chip Design. By doing this they have exploded the government-supported myth that the Data Encryption Standard (DES) has real security. National Security Agency and FBI officials say our civil liberties must be curtailed because the government can't crack the security of DES to wiretap bad guys. But somehow a tiny nonprofit has designed and built a $200,000 machine that cracks DES in a week. Who's lying, and why? For the first time, the book reveals full technical details on how researchers and data-recovery engineers can build a working DES Cracker. It includes design specifications and board schematics, as well as full source code for the custom chip, a chip simulator, and the software that drives the system. The U.S. government makes it illegal to publish these details on the Web, but they're printed here in a form that's easy to read and understand, legal to publish, and convenient for scanning into your computer. The Data Encryption Standard withstood the test of time for twenty years. This book shows exactly how it was brought down. Every cryptographer, security designer, and student of cryptography policy should read this book to understand how the world changed as it fell.